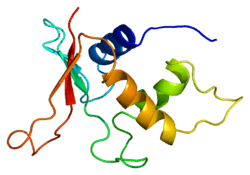 Interferon regulatory factor 2 is a protein that in humans is encoded by the IRF2 gene. IRF2 has been shown to interact with BRD7, EP300 and PCAF. ↑ Harada H, Fujita T, Miyamoto M, Kimura Y, Maruyama M, Furia A, Miyata T, Taniguchi T (September 1989). "Structurally similar but functionally distinct factors, IRF-1 and IRF-2, bind to the same regulatory elements of IFN and IFN-inducible genes". Cell. 58 (4): 729–39. doi:10.1016/0092-8674(89)90107-4. PMID 2475256. ↑ "Entrez Gene: IRF2 interferon regulatory factor 2". ↑ Staal A, Enserink JM, Stein JL, Stein GS, van Wijnen AJ (November 2000). "Molecular characterization of celtix-1, a bromodomain protein interacting with the transcription factor interferon regulatory factor 2". J. Cell. Physiol. 185 (2): 269–79. doi:10.1002/1097-4652(200011)185:2<269::AID-JCP12>3.0.CO;2-L. PMID 11025449. 1 2 Masumi A, Ozato K (June 2001). "Coactivator p300 acetylates the interferon regulatory factor-2 in U937 cells following phorbol ester treatment". J. Biol. Chem. 276 (24): 20973–80. doi:10.1074/jbc.M101707200. PMID 11304541. ↑ Masumi A, Wang IM, Lefebvre B, Yang XJ, Nakatani Y, Ozato K (March 1999). "The Histone Acetylase PCAF Is a Phorbol-Ester-Inducible Coactivator of the IRF Family That Confers Enhanced Interferon Responsiveness". Mol. Cell. Biol. 19 (3): 1810–20. PMC 83974 . PMID 10022868. Harada H, Taniguchi T, Tanaka N (1999). "The role of interferon regulatory factors in the interferon system and cell growth control". Biochimie. 80 (8–9): 641–50. doi:10.1016/S0300-9084(99)80017-0. PMID 9865486. Itoh S, Harada H, Fujita T, Mimura T, Taniguchi T (1989). "Sequence of a cDNA coding for human IRF-2". Nucleic Acids Res. 17 (20): 8372. doi:10.1093/nar/17.20.8372. PMC 334978 . PMID 2813069. Harada H, Takahashi E, Itoh S, Harada K, Hori TA, Taniguchi T (1994). "Structure and regulation of the human interferon regulatory factor 1 (IRF-1) and IRF-2 genes: implications for a gene network in the interferon system". Mol. Cell. Biol. 14 (2): 1500–9. PMC 358505 . PMID 7507207. Sharf R, Azriel A, Lejbkowicz F, Winograd SS, Ehrlich R, Levi BZ (1995). "Functional domain analysis of interferon consensus sequence binding protein (ICSBP) and its association with interferon regulatory factors". J. Biol. Chem. 270 (22): 13063–9. doi:10.1074/jbc.270.22.13063. PMID 7768900. Cha Y, Deisseroth AB (1994). 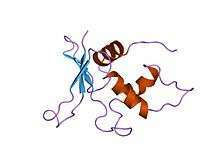 "Human interferon regulatory factor 2 gene. Intron-exon organization and functional analysis of 5'-flanking region". J. Biol. Chem. 269 (7): 5279–87. PMID 8106512. Harada H, Kitagawa M, Tanaka N, Yamamoto H, Harada K, Ishihara M, Taniguchi T (1993). "Anti-oncogenic and oncogenic potentials of interferon regulatory factors-1 and -2". Science. 259 (5097): 971–4. doi:10.1126/science.8438157. PMID 8438157. Drew PD, Franzoso G, Carlson LM, Biddison WE, Siebenlist U, Ozato K (1996). "Interferon regulatory factor-2 physically interacts with NF-kappa B in vitro and inhibits NF-kappa B induction of major histocompatibility class I and beta 2-microglobulin gene expression in transfected human neuroblastoma cells". J. Neuroimmunol. 63 (2): 157–62. doi:10.1016/0165-5728(95)00140-9. PMID 8550813. Birnbaum MJ, van Zundert B, Vaughan PS, Whitmarsh AJ, van Wijnen AJ, Davis RJ, Stein GS, Stein JL (1997). "Phosphorylation of the oncogenic transcription factor interferon regulatory factor 2 (IRF2) in vitro and in vivo". J. Cell. Biochem. 66 (2): 175–83. doi:10.1002/(SICI)1097-4644(19970801)66:2<175::AID-JCB5>3.0.CO;2-N. PMID 9213219. Masumi A, Wang IM, Lefebvre B, Yang XJ, Nakatani Y, Ozato K (1999). "The Histone Acetylase PCAF Is a Phorbol-Ester-Inducible Coactivator of the IRF Family That Confers Enhanced Interferon Responsiveness". Mol. Cell. Biol. 19 (3): 1810–20. PMC 83974 . PMID 10022868. Li W, Nagineni CN, Hooks JJ, Chepelinsky AB, Egwuagu CE (1999). "Interferon-gamma signaling in human retinal pigment epithelial cells mediated by STAT1, ICSBP, and IRF-1 transcription factors". Invest. Ophthalmol. Vis. Sci. 40 (5): 976–82. PMID 10102295. Whitney LW, Becker KG, Tresser NJ, Caballero-Ramos CI, Munson PJ, Prabhu VV, Trent JM, McFarland HF, Biddison WE (1999). "Analysis of gene expression in multiple sclerosis lesions using cDNA microarrays". Ann. Neurol. 46 (3): 425–8. doi:10.1002/1531-8249(199909)46:3<425::AID-ANA22>3.0.CO;2-O. PMID 10482277. Mild GC, Schmahl GE, Shayan P, Niemeyer CM (2000). "Expression of interferon regulatory factor 1 and 2 in hematopoietic cells of children with juvenile myelomonocytic leukemia". Leuk. Lymphoma. 35 (5–6): 507–11. doi:10.1080/10428199909169615. PMID 10609788. Staal A, Enserink JM, Stein JL, Stein GS, van Wijnen AJ (2000). "Molecular characterization of celtix-1, a bromodomain protein interacting with the transcription factor interferon regulatory factor 2". J. Cell. Physiol. 185 (2): 269–79. doi:10.1002/1097-4652(200011)185:2<269::AID-JCP12>3.0.CO;2-L. PMID 11025449. Larrea E, Alberdi A, Castelruiz Y, Boya P, Civeira MP, Prieto J (2001). "Expression of interferon-alpha subtypes in peripheral mononuclear cells from patients with chronic hepatitis C: a role for interferon-alpha5". J. Viral Hepat. 8 (2): 103–10. doi:10.1046/j.1365-2893.2001.00273.x. PMID 11264730. Masumi A, Ozato K (2001). "Coactivator p300 acetylates the interferon regulatory factor-2 in U937 cells following phorbol ester treatment". J. Biol. Chem. 276 (24): 20973–80. doi:10.1074/jbc.M101707200. PMID 11304541. 2irf: CRYSTAL STRUCTURE OF AN IRF-2/DNA COMPLEX.